This document is a guide to the behaviour of the twisted.internet.defer.Deferred object, and to various ways you can use them when they are returned by functions. This document assumes that you are familiar with the basic principle that the Twisted framework is structured around: asynchronous, callback-based programming, where instead of having blocking code in your program or using threads to run blocking code, you have functions that return immediately and then begin a callback chain when data is available. After reading this document, the reader should expect to be able to deal with most simple APIs in Twisted and Twisted-using code that return Deferreds. how you can write your code to robustly handle errors in Deferred code. Twisted uses the Deferred object to manage the callback sequence. The client application attaches a series of functions to the deferred to be called in order when the results of the asychronous request are available (this series of functions is known as a series of callbacks, or a callback chain), together with a series of functions to be called if there is an error in the asychronous request (known as a series of errbacks or an errback chain). The asychronous library code calls the first callback when the result is available, or the first errback when an error occurs, and the Deferred object then hands the results of each callback or errback function to the next function in the chain. A twisted.internet.defer.Deferred is a promise that a function will at some point have a result. We can attach callback functions to a Deferred, and once it gets a result these callbacks will be called. In addition Deferreds allow the developer to register a callback for an error, with the default behavior of logging the error. The deferred mechanism standardizes the application programmer's interface with all sorts of blocking or delayed operations. Multiple callbacks can be added to a Deferred. The first callback in the Deferred's callback chain will be called with the result, the second with the result of the first callback, and so on. Why do we need this? Well, consider a Deferred returned by twisted.enterprise.adbapi - the result of a SQL query. A web widget might add a callback that converts this result into HTML, and pass the Deferred onwards, where the callback will be used by twisted to return the result to the HTTP client. The callback chain will be bypassed in case of errors or exceptions. conditions. In this case, odd numbers are bad. This function converts r to HTML. The Deferred mechanism allows for chained callbacks. passed through _toHTML on its way to printData. # this series of callbacks and errbacks will print "Result: 12"
Requesting method (data sink) requests data, gets Deferred object. Requesting method attaches callbacks to Deferred object. When the result is ready, give it to the Deferred object. .callback(result) if the operation succeeded, .errback(failure) if it failed. Note that failure is typically an instance of a twisted.python.failure.Failure instance. Deferred object triggers previously-added (call/err)back with the result or failure. Execution then follows the following rules, going down the chain of callbacks to be processed. Result of the callback is always passed as the first argument to the next callback, creating a chain of processors. If a callback raises an exception, switch to errback. An unhandled failure gets passed down the line of errbacks, this creating an asynchronous analog to a series to a series of except: statements. If an errback doesn't raise an exception or return a twisted.python.failure.Failure instance, switch to callback. Deferred's error handling is modeled after Python's exception handling. In the case that no errors occur, all the callbacks run, one after the other, as described above. If the errback is called instead of the callback (e.g. because a DB query raised an error), then a twisted.python.failure.Failure is passed into the first errback (you can add multiple errbacks, just like with callbacks). You can think of your errbacks as being like except blocks of ordinary Python code. Unless you explicitly raise an error in except block, the Exception is caught and stops propagating, and normal execution continues. The same thing happens with errbacks: unless you explicitly return a Failure or (re-)raise an exception, the error stops propagating, and normal callbacks continue executing from that point (using the value returned from the errback). If the errback does returns a Failure or raise an exception, then that is passed to the next errback, and so on. Note: If an errback doesn't return anything, then it effectively returns None, meaning that callbacks will continue to be executed after this errback. This may not be what you expect to happen, so be careful. Make sure your errbacks return a Failure (probably the one that was passed to it), or a meaningful return value for the next callback. If none of arguments passed to failure.trap match the error encapsulated in that Failure, then it re-raises the error. If an error occurs in callback1, then for Case 1 errback1 will be called with the failure. For Case 2, errback2 will be called. Be careful with your callbacks and errbacks. What this means in a practical sense is in Case 1, "A" will handle a success condition from getDeferredFromSomewhere, and "B" will handle any errors that occur from either the upstream source, or that occur in 'A'. In Case 2, "C"'s errback1 will only handle an error condition raised by getDeferredFromSomewhere, it will not do any handling of errors raised in callback1. In some applications, there are functions that might be either asynchronous or synchronous. For example, a user authentication function might be able to check in memory whether a user is authenticated, allowing the authentication function to return an immediate result, or it may need to wait on network data, in which case it should return a Deferred to be fired when that data arrives. However, a function that wants to check if a user is authenticated will then need to accept both immediate results and Deferreds. print "User is not authenticated"
However, it assumes that isValidUser returns immediately, whereas isValidUser may actually authenticate the user asynchronously and return a Deferred. It is possible to adapt this trivial user authentication code to accept either a synchronous isValidUser or an asynchronous isValidUser, allowing the library to handle either type of function. It is, however, also possible to adapt synchronous functions to return Deferreds. This section describes both alternatives: handling functions that might be synchronous or asynchronous in the library function (authenticateUser) or in the application code. Now isValidUser could be either synchronousIsValidUser or asynchronousIsValidUser. It is also possible to modify synchronousIsValidUser to return a Deferred, see Generating Deferreds for more information. Sometimes you want to be notified after several different events have all happened, rather than waiting for each one individually. For example, you may want to wait for all the connections in a list to close. twisted.internet.defer.DeferredList is the way to do this. A standard DeferredList will never call errback, but failures in Deferreds passed to a DeferredList will still errback unless consumeErrors is passed True. See below for more details about this and other flags which modify the behavior of DeferredList. If you want to apply callbacks to the individual Deferreds that go into the DeferredList, you should be careful about when those callbacks are added. The act of adding a Deferred to a DeferredList inserts a callback into that Deferred (when that callback is run, it checks to see if the DeferredList has been completed yet). The important thing to remember is that it is this callback which records the value that goes into the result list handed to the DeferredList's callback. Therefore, if you add a callback to the Deferred after adding the Deferred to the DeferredList, the value returned by that callback will not be given to the DeferredList's callback. To avoid confusion, we recommend not adding callbacks to a Deferred once it has been used in a DeferredList. return result + " ten"
deferred1.callback("one") # fires addTen, checks DeferredList, stores "one ten"
DeferredList accepts three keyword arguments that modify its behaviour: fireOnOneCallback, fireOnOneErrback and consumeErrors. If fireOnOneCallback is set, the DeferredList will immediately call its callback as soon as any of its Deferreds call their callback. Similarly, fireOnOneErrback will call errback as soon as any of the Deferreds call their errback. Note that DeferredList is still one-shot, like ordinary Deferreds, so after a callback or errback has been called the DeferredList will do nothing further (it will just silently ignore any other results from its Deferreds). The fireOnOneErrback option is particularly useful when you want to wait for all the results if everything succeeds, but also want to know immediately if something fails. The consumeErrors argument will stop the DeferredList from propagating any errors along the callback chains of any Deferreds it contains (usually creating a DeferredList has no effect on the results passed along the callbacks and errbacks of their Deferreds). Stopping errors at the DeferredList with this option will prevent Unhandled error in Deferred warnings from the Deferreds it contains without needing to add extra errbacks1. This is an overview API reference for Deferred from the point of using a Deferred returned by a function. It is not meant to be a substitute for the docstrings in the Deferred class, but can provide guidelines for its use. There is a parallel overview of functions used by the Deferred's creator in Generating Deferreds. This is the method you will use to interact with Deferred. 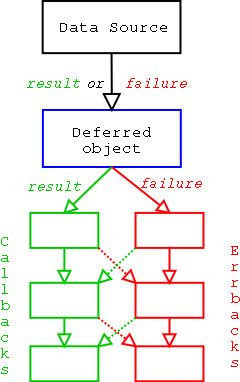 It adds a pair of callbacks parallel to each other (see diagram above) in the list of callbacks made when the Deferred is called back to. The signature of a method added using addCallbacks should be myMethod(result, *methodArgs, **methodKeywords). If your method is passed in the callback slot, for example, all arguments in the tuple callbackArgs will be passed as *methodArgs to your method. There are various convenience methods that are derivative of addCallbacks. I will not cover them in detail here, but it is important to know about them in order to create concise code. Adds your callback at the next point in the processing chain, while adding an errback that will re-raise its first argument, not affecting further processing in the error case. Note that, while addCallbacks (plural) requires the arguments to be passed in a tuple, addCallback (singular) takes all its remaining arguments as things to be passed to the callback function. The reason is obvious: addCallbacks (plural) cannot tell whether the arguments are meant for the callback or the errback, so they must be specifically marked by putting them into a tuple. addCallback (singular) knows that everything is destined to go to the callback, so it can use Python's * and ** syntax to collect the remaining arguments. Adds your errback at the next point in the processing chain, while adding a callback that will return its first argument, not affecting further processing in the success case. This method adds the same callback into both sides of the processing chain at both points. Keep in mind that the type of the first argument is indeterminate if you use this method! Use it for finally: style blocks. If you need one Deferred to wait on another, all you need to do is return a Deferred from a method added to addCallbacks. Specifically, if you return Deferred B from a method added to Deferred A using A.addCallbacks, Deferred A's processing chain will stop until Deferred B's .callback() method is called; at that point, the next callback in A will be passed the result of the last callback in Deferred B's processing chain at the time. If this seems confusing, don't worry about it right now -- when you run into a situation where you need this behavior, you will probably recognize it immediately and realize why this happens. If you want to chain deferreds manually, there is also a convenience method to help you. Generating Deferreds, an introduction to writing asynchronous functions that return Deferreds. Unless of course a later callback starts a fresh error — but as we've already noted, adding callbacks to a Deferred after its used in a DeferredList is confusing and usually avoided.